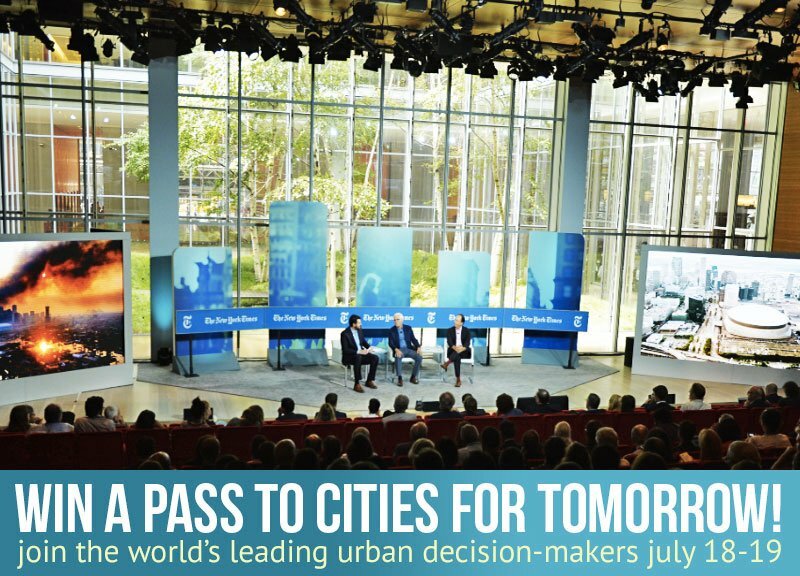 Join the world’s leading urban-thinkers for the New York Times’ 3rd annual Cities for Tomorrow conference. 6sqft has teamed up with the Times to give one lucky reader a free pass (worth $950!) to the event happening July 18-19th in Midtown Manhattan. This year’s talks are centered on identifying and dissecting the best ideas that lead to flourishing cities. Speakers on the docket include experts from various industries, such as architect Jeanne Gang, restaurateur Danny Meyer, “Broad City” producer Eric Slovin, and economist Edward Glaeser. HOW TO ENTER: All you have to do is sign up for our newsletter here. If you’ve already signed up, simply leave a comment below telling us what topic off this year’s agenda interests you the most. The deadline to enter is 11:59PM, Wednesday, July 13th (That’s TONIGHT!). We will email the winner on July 14th. Good luck! Those interested in purchasing a ticket can also do so by requesting an invitation through NYTCitiesForTomorrow.com. “Aspirations and Angst: What do our TV shows tell us about our cities?” looks great and interesting. Love Broad City! Hungry Metropolis. It’d be interesting to hear what the panelists have to say about food’s role in gentrification – in addition to all the pros. I’m interested in the “Preservation: Pride or Prejudice” with Ed Glaeser. I’d love to hear Jeanne Gang speak. She’s such an underrated architect; She’s got style and she seamlessly brings sustainability to the heart of her projects. I’m surprised that she hasn’t gotten more NYC commissions. Teaching Rich and Poor Alike. Teaching the future what is possible and I find this can be a big boon to urban areas. I love to hear Edward Glaeser – Preservation: Pride or Prejudice? As a New York City employee I would love to attend the conference just to hear Mayor Barry’s “Change From The Ground Up” talk on how streamlined bureaucracy can improve/solve some of a city’s biggest issues. Entry comment: How can city infrastructure problems be addressed, i.e. combined sewer overflows, leaking water, sewer and gas pipelines, overhead electrical wiring? Will 3D printed, modular components with embedded smart systems play a role by replacing the existing networks? I am a real estate financial and market analyst in New York City. I also attend/consult for the New York City Landmark Preservation Commission and Neighborhood Coalition for Shelter. I am very interested to hear the opinions of each speaker regarding preservation and the economic impact of urban real estate moving forward within various markets. Frankly, there is not a presentation I don’t want to hear. It is going to be fabulous all around.